It seems like an injustice to design to buy a super sleek tech product only to mask it with a bulky case. Apparently Apple thought so too, and thus the Smart Cover for Apple’s iPad 2 was born. 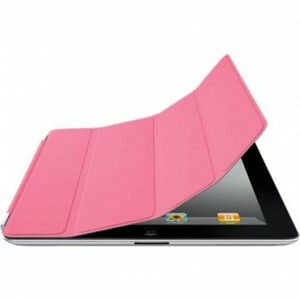 The thin polyurethane cover, actually designed in tandem with the iPad 2, protects the tablet’s screen while highlighting its thin design. As a graduation present, I received one in pink alongside a new iPad 2. The cover, a rectangular foldable piece with magnets to attach to the tablet, proved easy enough to use once I practiced a few times, fit perfectly to the tablet, and made using my iPad even easier. When you open the Smart Cover, your iPad magically wakes—no button pressing necessary. Close it, and you hear the delightful click of the iPad going to sleep. The magnets also hold the cover in place when you fold it into a keyboard stand. And from keyboard stand, it can become a screen wipe—just disconnect and slide the rolled cover up and down the screen a few times. This Smart Cover feature proved really helpful when I used my iPad to take notes in class and my fingers were all over the screen. The bubblegum-colored cover, though not my top choice color wise, definitely drew attention to my fancy new gift. The downside of choosing just a cover and not a case, however, is that your iPad is still at some serious risk. You must remember that a) the back of your iPad is still exposed and b) the magnets are strong but not strong enough to save the iPad from a fall. My 10-year-old brother grabbed the Smart Cover of my 1-month-old iPad as it fell from his hands, but all he was left holding after gravity did its thing was a limp cover and a shattered iPad at his feet. If you’re looking for something still sleek with a little more protection, I would recommend something like The Ultra Thin Smarty Complete iPad 2 case, which has a foldable cover but also a back. There are also quite a few more economical options out there. However, for those who aren’t clumsy and won’t be exposing their tablet to the wrath of children, the polyurethane Smart Cover is a good way to keep your screen clean and stick with Apple branding.